That Business Show weekdays at 8am on 1250 WHNZ and also available via our live stream at http://www.tampabayradio.com. Catch all past shows on the site as well as on iTunes, SoundCloud and YouTube! Shari Mezrah joined me in studio today for the first half of the show. Shari, aka The Sleep Mom, is a family sleep and schedule specialist and mother of two who developed the innovative The Baby Sleeps Tonight program in 1999 and author of the book on the topic The Baby Sleeps Tonight: Your Infant Sleeping Through the Night by 9 Weeks published in 2010 and available on her website at http://www.thesleepmom.com as well as on Amazon.Com. Shari runs BabyTIME which is a consulting business on this topic and through her book and company she has assisted hundreds of families worldwide turn chaos into calm and regain control over their lives. We touched on some great tips that she covers extensively in her book including putting your baby onto a regular feeding schedule throughout the day to assist them in sleeping through the night as well as the importance of giving the baby, their own space and avoiding sleeping with the baby. Her book has international reach and was just published in French and is an excellent resource for new parents. She developed an app called “Baby Sleep Tunes” which is available to assist new parents also and is a collection of baby hit classics to lull your child to sleep quickly and easily. 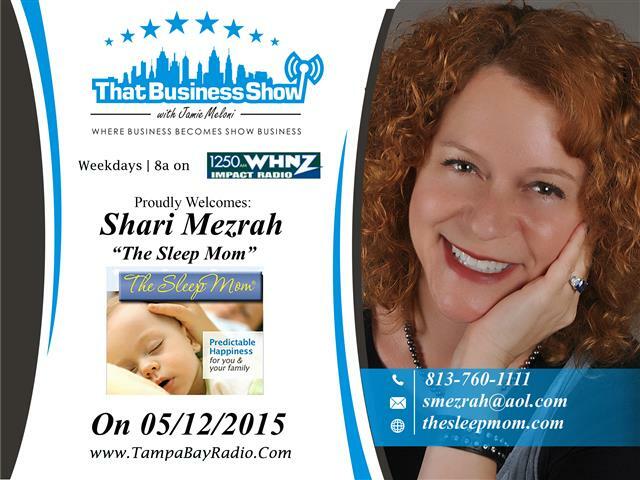 Learn more at her website http://www.thesleepmom.com and reach out to her directly at 813-760-1111 or email smezrah@aol.com for assistance! 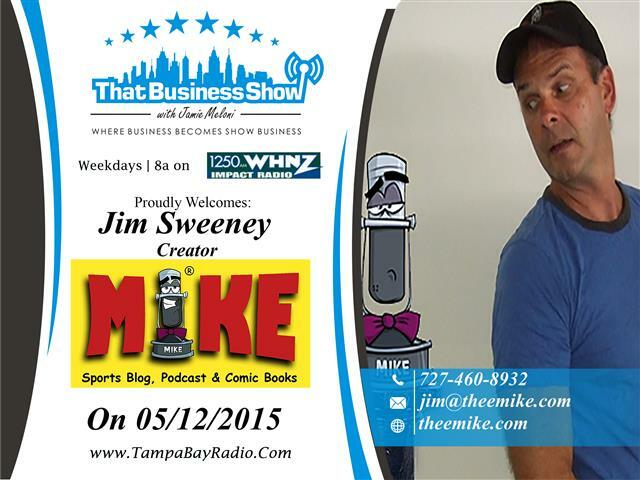 On the 2nd half of the show, I welcomed Jim Sweeney in studio. Jim is the creator of the Trademarked MIKE cartoon sports character which has gained great traction in the media as well as through his many blogs and comics. He has recently launched a podcast to bolster the character and is available on iTunes and Stitcher radio and called MIKE on Sports. This witty creation is unique in that it is the only character that transcends all sports and through Jim’s creative stories, skits and posts has grown in popularity to the point that major networks have taken notice and have begun extending him offers to nationalize this character on the grand stage. We discuss some of the many comics (36 MIKE Sports Comic Books) as well as a few of his over 650 blog posts on this show and Jim gets his creativity and humor across to the audience very well. Jim’s inspiration for this character is to make him a household name such as the Aflac Duck or Geico Gekko and he is well on his way to doing just that. Learn more about this character via his podcast on iTunes and Stitcher radio under MIKE on Sports and also visit his website/blog at http://www.theemike.com. eBooks are also available on Amazon.Com. For more information, he can be reached at 727-460-8932 or email at jim@theemike.com!